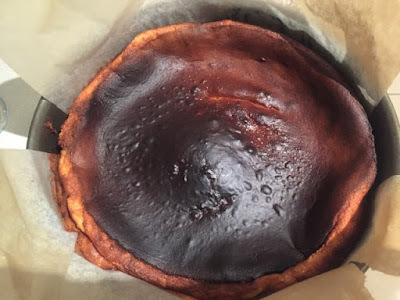 Researching our next trip to the Basque region, I came across a recipe for a Basque burnt cheesecake. In readiness for our trip to San Sebastian and the food to eat, I was excited to learn that this is a place where you have to eat dessert first. Not due to the fact that this is a Basque tradition but if we were to fill ourselves on savoury tapas, all this delicious cheesecake from the cafes will be gone. This must be the easiest cheesecake to make and equally delicious. I'll be sure to make a trip to the cafes in San Sebastián to get my fill of this cheesecake. And yes dear sister, it's meant to be burnt as the sugars form a delicious crust which I can't get enough of. Will make it for you soon. 2. Grease and line the bass and sides of a 23cm springform cake pan with baking paper so the paper comes 2cm above the rim of the pan. 3. Beat the cream cheese using electric beaters until smooth and creamy. 4. Add the eggs, 1 at a time, beating well after each addition. 5. Gradually beat in the sugar, then the cream, then add the flour and beat until smooth. 6. Pour the cheesecake batter into the prepared pan and tap the pan gently on a flat surface to remove any air bubbles. 7. Bake for 50mins or until the top is dark brown and cake is set with a slight wobble in the centre and a skewer inserted into the centre comes out clean. 8. Remove from the oven and leave to cool completely before removing from the pan. 9. The cake is best eaten within a few hours of baking. (Actually is still really good til the next day). The recipe did ask for double cream (fat content of 48%) as it is the most versatile cream because it withstands boiling and whips and freezes well. But I opted for the thickened cream (fat content of 35%) which does an equally good job for this cheesecake and for whipping into cream.